1. Everything will bite or sting. The list went on and on and included nearly every species that we saw. And it wasn’t just on this first day that everything would bite or sting us; practically every day, Ramiro pointed out something else new that we should stay away from. 2. Miners and loggers will show wherever you are. 3. You’re expected to speak Spanish, but it’s okay if it’s not perfect. Unlike many European countries where we’ve traveled, Peruvians come up to you and begin speaking Spanish, even when they know you’re American. This has been highly welcomed, as it allows us all a chance to practice our Spanish. At the same time, everyone has been extremely patient with us, listening to even the beginning Spanish speaker in our group (Jackie), as she slowly puts together her sentences. It has not only provided us with invaluable learning opportunities, but also with many comedic moments. For example, after sampling on shore and before returning to the boat, Jackie informed our guide Ramiro, that all of us, including him, were going to go the bathroom now. Everyone laughed, Ramiro corrected her statement, and we girls had a chance to use the “facilitrees” before continuing our journey. 4. Birding is an extreme sport, and everyone must participate. Madre de Dios, Peru, is a global biodiversity hotspot – home to a large number of species. While this category extends to plants and animals of all types, it is particularly renowned for the more than 600 species of birds that can be found here. We came across many birders during our time, especially at the two biological stations we visited – Los Amigos and Cocha Cashu. The most impressive was a student named Alex, who broke the “Birding Big Day” record of identifying (by sight and sound) 347 bird species in the course of 24 hours. We did not come to Peru as birders, but we found ourselves becoming caught up in listening to the sounds of the birds, searching for them dotting the shore and flying through the canopy, and trying to recall as many of their species names as we could. One of our favorite parts of our stay at the biological field stations was our discussions with other researchers over dinner – the topic of conversation was often about birds. We are not competitive birders like Alex, but we certainly gained some expertise as we joined in on this extreme sport. 5. Peru time – for everything except meals. 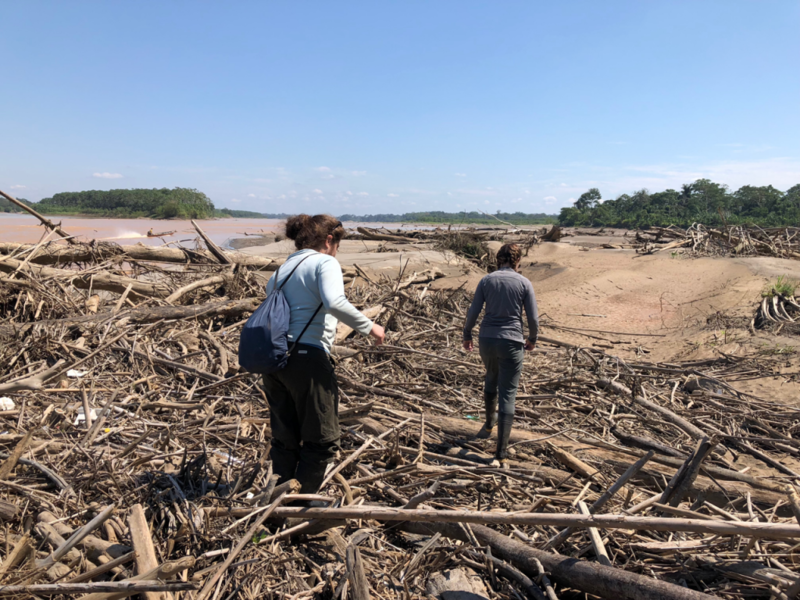 On our fourth day in Peru, it was time to begin our adventure down the Madre de Dios River to collect environmental samples. We stood on the corner of a public square, waiting with all of our equipment first for our PVC-pipe-guy (a man we hired to drill holes into our 55 meter-long PVC pipes) to arrive at 8 am and then our driver (to take us on an eight-hour trip down from Cusco in the valley to Atalaya in the rainforest) at 8:30 am. After showing up early and patiently waiting until 8:30, we saw no sign of our PVC guy and called to confirm that he was on his way. His daughter answered the phone and assured us that he was actively looking for a cab to meet us as soon as possible. Another hour passed, and finally he arrived with our pipes filling the entire backseat and trunk of a large car, but we still awaited our driver, now with the additional baggage of the 55 PVC pipes besides us. Finally, at around 11 am, our driver pulled into the square, and we were off. When we finally arrived at the midway point for a late lunch, we found every restaurant in the small town to be closed (at 2:30 pm… not THAT late). We learned a valuable lesson on this first day in the Amazon: Peru runs at least an hour late (they tell you 8 am, you know they won’t be ready until 9 am at the earliest), except when it comes to food (you better get there five minutes early or all the food will be gone). 6. If you’re staying in a village, roosters are your alarm clock; if you’re staying anywhere else, the sun is your alarm clock. During our trip, we surrendered our iPhone alarm apps in favor of the sounds of the Amazon gently waking us up. While staying in Boca Manu (a village upstream of gold mining), one can’t expect to sleep in until sunrise. On a good day, the plethora of resident roosters courteously wait until 5 am before they start their daily screaming ritual. However, most days we began to hear our feathery friends’ screeching chorus at 3:30 am through the plywood/mesh walls of our room. In the town of Laberinto, we were awoken by welders jamming out in their workshop across the street from our hostel/indoor soccer field called Secreto 2. When camping on the beach, we were greeted by the warmth and soft light of the early morning sun peering through our mesh tent and miners beginning their day’s work with noisy diesel engines. All of this makes for a quick adjustment to the typical circadian rhythm of a college student – up by 5:30 am and tucked in bed, mosquito net secured, by 8 pm. Who decided 8:30 classes were the worst things in the world? 7. Scorpio does chase Orion through the sky. When Marc asked us to walk with him to the beach at 11 pm on a Tuesday, we had to really weigh our options. 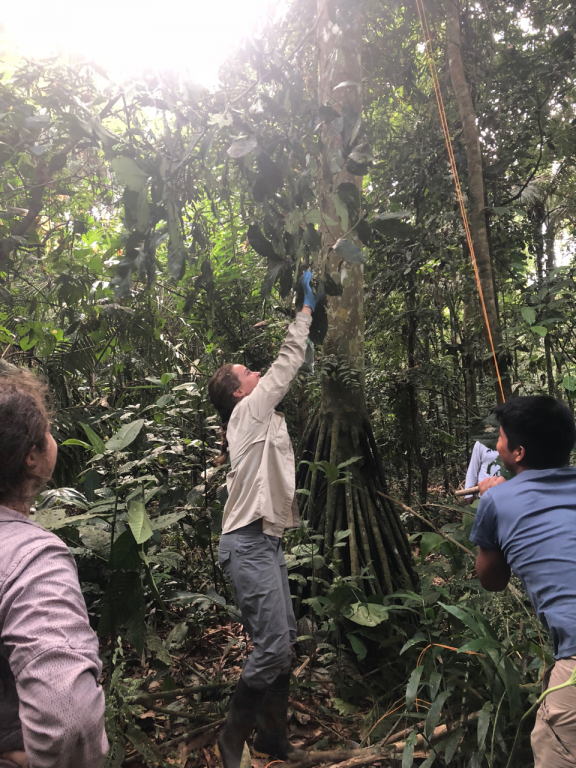 On the one hand, Marc, a German student staying with us at Cocha Cashu, had been at the Biological Research Station longer than us and promised that the stars were unbelievable on the beach. On the other hand, the beach held sand fleas that often carried leishmaniasis (a parasitic skin infection), and it was well past our 8 pm bedtime. We ultimately decided to swallow our fear and quickly ran back to our tent to grab a jacket. As we followed our new friends down the half-kilometer trail to the beach, we watched the light from our headlamps bounce off all the amazing nocturnal insects lining the trail. Once we turned off our lights at the beach, we could see what seemed like every star in the night sky. In this remote location, a two-day boat ride from any town with reliable electricity, we saw planets, the moon, and constellations that we had never seen in the Northern Hemisphere. We finally saw Scorpio, the constellation that Orion (a commonly known constellation in the Northern Hemisphere) is said to be chasing around the world. 8. Don’t be afraid of your own thoughts. One of our favorite sites on our trip was the remote oxbow lake and Biological Research Station, Cocha Cashu. 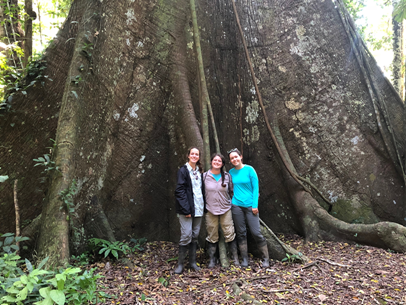 We were awed by the comradery amongst the visitors (scientists and tourists alike), fostered by family-style meals and introductions where we shared our backgrounds and answered fun questions. One night, we shared what about the jungle scares us. (Answer: everything.) There were the expected responses: jaguars clawing at your tent (which happened to one of the cooks the previous year), uta (leishmaniasis), snakes, and spiders. One of the most original responses we heard from a fellow researcher was that his worst night fear was his “own thoughts.” Peru on a research trip is not the place for you, my friend. During our trip, we really got to know ourselves. Spending up to 8 hours per day on a boat with little to do besides watch the trees pass by provides a lot of opportunity for introspection (and naps). When we were not on the boat, we amused ourselves in the form of five-hour-long hikes, where we walked in silence to see wildlife, thereby providing additional opportunities to get lost in our own thoughts. On land and on water, the majority of our days consisted of time with ourselves, which has proven both relaxing and healing, though frightening for some. 9. Citronella is the new Chanel 5, and rubber boots are the new Louboutins. “Cockle-doodle-doooo!” Our usual wake-up call from the roosters in town has us out of bed before the sun has time to settle in the sky. We pull on our headlamps and begin our morning ritual. We start by getting dressed in our Peruvian uniform: a quick-dry t-shirt (short or long sleeved depending on the temperature which differs wildly week-to-week), button-down Columbia PFG fishing shirt (to serve as both a layer and to protect our arms), dry-fit field pants (with lots of pockets for all the Sharpies we seem to keep losing), knee-high socks (which keep getting dirtier as we follow the “no shoes in the dining hall” rule), and our trusty rubber boots (that we wear for EVERYTHING; sitting on the boat so that we can debark directly into the water, hiking on snake-filled trails, and walking through towns lined with muddy roads and paths). While this outfit covers as much skin as possible, which is necessary even in the 100% humidity to avoid those pesky mosquitos, the outfit isn’t complete without a head-to-toe spray of Citronella as a final deterrent for the bugs that just won’t leave us alone. 10. White rice is in every meal. Breakfast, lunch, and dinner – white rice. Fresh fried eggs and a heaping scoop of rice first thing in the morning, chicken and vegetables over rice for lunch, and delicious chufa (fried… you guessed it… rice) for dinner. This beautiful grain has been a constant in our lives for the past two months and is a staple of the Peruvian diet. One night, while cooking dinner on the beach under the light of our headlamps and trying to avoid swarms of flies, we decided to pass the time by calculating how much white rice we have consumed over the course of this trip. That night, for our group of five, we made two kilos of rice and divided it equally, with a little left over. Our 1/3 kilo portions were fairly representative of that consumed during each of our meals. Over seven weeks – 49 days – we have eaten 16 and 1/3 kilos of rice each (36 pounds), truly adopting the typical Amazonian diet in Peru. Editor's note: Learn more about this Bass Connections project and team.